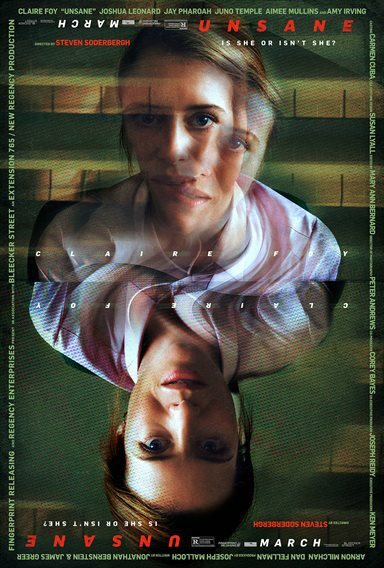 Download Unsane in Digital HD from the iTunes store. Unsane images are © Bleecker Street. All Rights Reserved. Claire Foy is certainly not a new face on the scene but with Netflix's hit series, The Crown, she has become a much more recognizable one. Her portrayal as Queen Elizabeth II has received much acclaim, and she even earned a Golden Globe Award for Best Performance by an Actress in a Television Series - Drama, as well as Screen Actors Guild Award for Outstanding Performance by a Female Actor in a Drama Series, both in 2017. Once again, Foy showcases her talent in this year's Unsane, available on Blu-ray. Foy portrays Sawyer Valentini, a businesswoman who finds herself being stalked by a man. After two years of this, Sawyer decides to move and get a job in a different city, seemingly to make a new start. She also decides to seek help in order to deal with her issues and finds a counselor. She explains her problems and how they have affected her life and mental health, and that she has had suicidal thoughts in the past. When she is offered more help in order to further explore the problems, she signs some paperwork and unknowingly commits herself to being in a psychiatric ward for 24 hours. She soon learns that this is worse than she originally thought. She realizes her stalker is an orderly at the ward and her behavior winds up earning her a weeklong stay. Sawyer tries to leave the ward but given her signature on the forms admitting herself, she can't leave. The police can't even intervene. She must find a way to be heard and escape before her stalker, David, (Joshua Leonard; The Blair Witch Project) can get a hold of her. Director Steven Soderbergh (Out of Sight), fresh off his critically acclaimed movie Logan Lucky, shot the movie on an iPhone 7 Plus in June 2017. In true Soderbergh fashion, the film has a gritty/somber feeling which, based on the subject matter, is a good idea in this case. The movie, because of its dark nature and subject matter, needs to feel more unpolished than the slick, glossy fare we are used to from Hollywood and his chosen method and equipment accomplishes that well. This also gives the movie a more of a first-hand perspective at times that plays into Sawyer's paranoia and builds the tension throughout the film. Foy has been garnering critical acclaim of late for good reason (as mentioned above) and she is an excellent choice to play the slightly unstable Sawyer. She seems to be sane but just slightly off-kilter and she tackles the complexity of the role masterfully. Leonard is a nice compliment to Foy as Sawyer's stalker David. He has just enough of a creepy vibe to make the viewer seemingly afraid of him. The rest of the cast is good but nobody stands out particularly in comparison to Foy. The Native 4K (2160p) video quality is clean despite being shot on an iPhone (or at least partially). However, I'm sure there was some post-production "magic" that cleaned up the resolution and probably a bit of color correction as well. The blacks are deep and varied which helps make the tone of the film seem creepier than it might otherwise. The DTS-HD Master Audio 5.1 is clear and free of almost any noise. Surround sounds can be heard nicely which immerses the viewer in various scenes helping to build the tension and suspense. The dialogue is set in the center channel but isn't exceptional in any way. Interestingly, there is only one four and a half minute long extra called Unsanity that is a behind the scenes view of the movie. With a talented lead actress and a unique approach to the subject matter, Unsane offers something a little different up until the end. As horror films go it's not the run of the mill jump scares or gore that makes it scary but the fear of the psychological aspect that makes one's skin crawl. I wish it had ended a little different but until that point, it is a worthwhile feature.